The Heinrichshof is one of the oldest wine farms of Bolzano. Its vines grow on blessed ground. Even the late Henry of Treviso, who was born about 1250 at Heinrichshof is said to have worked as a teenager in the vineyards of the farm. As patron of Bolzano, the church is dedicated to him at the Heinrichshof. A hundred years ago you had to leave the city of Bolzano and about north hike fifteen minutes over a bumpy road between meadows and vineyards to achieve “Bolzano village” and the Heinrichshof. The city has expanded and today the Heinrichshof is the first Weinhof with sunny steep slopes outside the city center. 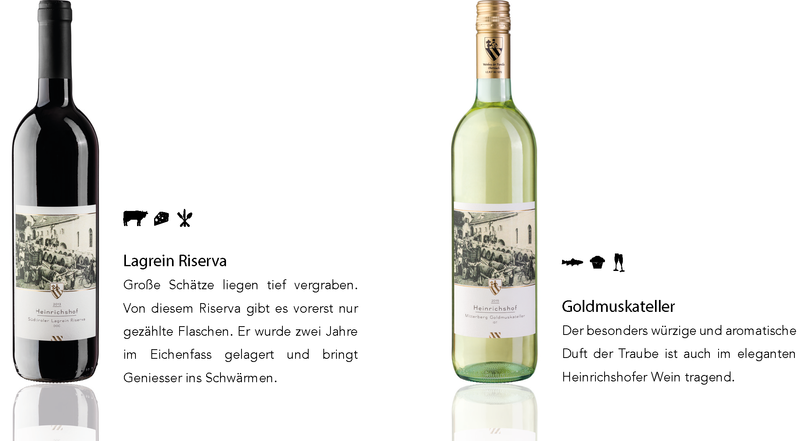 The wine has a centuries-old tradition in Bolzano as well as the basement story of Heinrichshof. 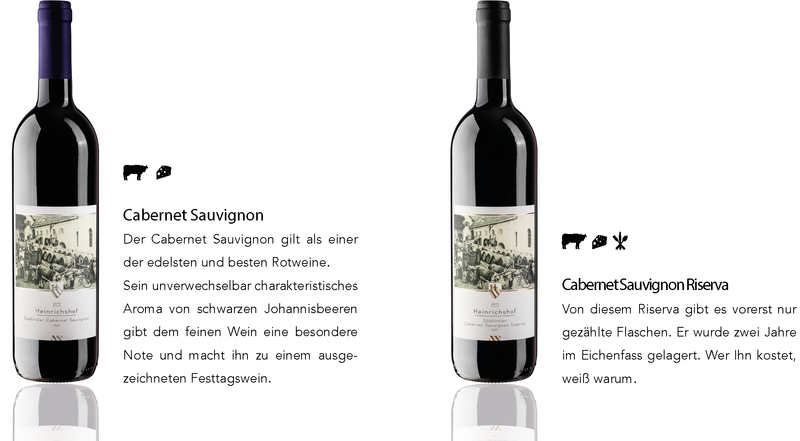 In 2003 Georg Oberrauch renewed the operation and enabled by a completely integrated into the vineyard cellar and modern winemaking technology, the production of fine quality wines. We love our vineyard with its steep and sunny slopes and we love our wine in all its facets. Every single grape at the Heinrichshof has its place and is cared with care and joy. And it is the joy that determines our mission, in the steep vineyard as in the deep cellar. We rely on our sensitivity for details. We spare no effort to only store healthy fruits. We are happy, thanks to years of experience, to be able to meet high quality standards. We live with enthusiasm in the vineyard and are happy about every fruit that our vines produce. Toast with a new vintage is always a celebration: enjoyment, gratitude, incentive, bliss. And even if many barrels are in the basement, the decisive factor is the one glass that delights the palate and heart. 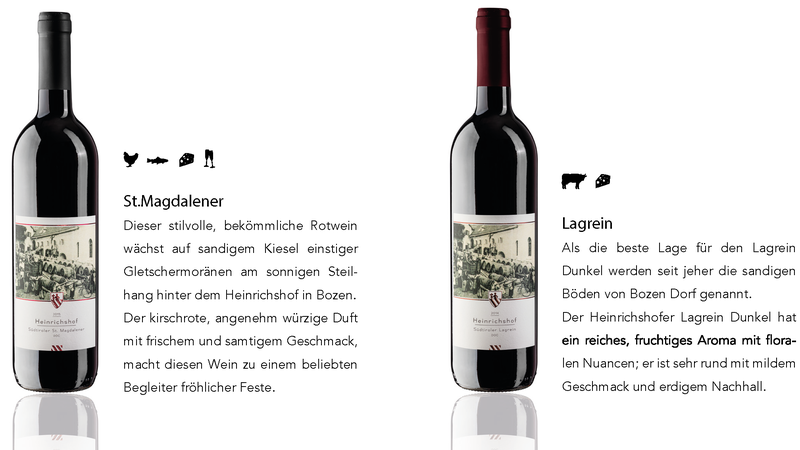 Anyone who learns this, understands our declaration of love for wine and vineyard and knows the Heinrichshof wine as something special to enjoy. We offer guided tours thru our winery and vineyard included the tasting of our wines. For prices and appointments, as well as for wine orders or other questions you can contact us anytime.